QINGDAO — Granted I’ve spent decades loving the New York Knicks, even though they’ve been hapless for over a decade. Plus, I’m convinced the NBA is the most exciting sports league in the world. Yet even with such personal predilections, it’s easy to argue that the best story in America this year — yes, the absolute best — was Jeremy Lin’s emergence from the end of the bench last February to propel the Knicks to seven straight victories, and eight wins in nine games. Lin’s incomparable play at point guard — the final-seconds countdown three that beat Toronto, the fourth quarter three in Madison Square Garden that sized up and embarrassd Dirk Nowitzki, the 38 points he rained on Kobe and the Lakers in an unforgettable Friday night Garden win — earned him a three-year, $25 million contract in July with the Houston Rockets. 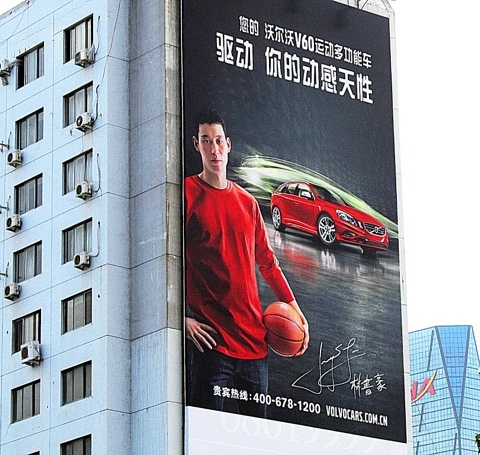 Though he’s no longer a Knick (more on that later) his never-to-be-forgotten fortnight also earned Lin icon status here in China. On Monday afternoon, while walking back to the hotel from the city’s Bureau of Statistics, I peered through the low canopy of Qingdao’s street trees and saw Lin’s image on a six-story billboard fixed to the north face of a downtown apartment building. Minutes later, while ordering a Cafe Americano in Starbucks (which are everywhere here, just like in New York), I spied a smartly attired Lin gracing the cover of Q, a men’s fashion and style magazine that feted him as a young man to admire. Those attributes, of course, aren’t the first words I use to describe Jeremy Lin. His story exemplifies and amplifies in such a wonderful way what it is to be American. And his celebrity, adorned as it is with such apparent maturity and studied modesty, could help clarify in the 21st century how sports, youth, skill, and global focus can span borders and cultures. Lin has said repeatedly in interviews that his life goal is to play an international role helping people. As an NBA player, he’s launched such important work in a significant way. Good for him. Lin, you may recall, is an American born son of immigrant Taiwanese parents who was raised in Palo Alto, California. He led his high school basketball team to a California state championship. Division I teams, including Stanford in his hometown, paid no attention. He enrolled at Harvard, and led the team out of obscurity to national respectability. He also earned a degree in economics and steady attention from Chinese television. The latter exposure was essential in developing the media seasoning, the camera-ready comfort and humility, that became a Lin trademark during Linsanity. Lin was signed by the Warriors, played sparingly, and was cut. He played well in NBA summer league games, attracted some attention from the Dallas Mavericks, played well in the NBA development league, and was picked up by the Knicks two days after Christmas last year. A run of injuries and losses in January prompted Knick coach Mike D’Antoni to summon Lin from the lonely seat at the end of the bench and insert him on February 4 late in the first quarter of a game against the New Jersey Nets. The slim American Chinese baller played out of his mind. Dishing assists. Running the break. Slashing down the lane for twisting layups. Hitting 18-foot jumpers. The Knicks won. Lin scored 25. The only people who weren’t surprised were the guys at Cornell and Penn and Princeton and Connecticut who’d played against him and knew Lin was fast, fearless, and canny. In the next game against the Utah Jazz two days later Lin started for the first time and scored 28 in a win. In game three against the Washington Wizards on February 9 he buckled John Wall, the number one draft pick in 2010, with a cross-over dribble and straight line dash to the basket that went viral on YouTube. The Knicks won again. Lin scored 23. The fifth win, the one that truly fixed Lin in the pantheon of sports legends, came in Toronto on Asian Heritage night. Half of the fans in the building were Chinese. The Knicks came from 17 back. Lin tied the score 87-87 with a driving scoop layup and a free throw with about a minute left. On the Knicks last possession with about 12 seconds left, and the score still tied, Lin had the ball at center court beyond the three point line. He glanced at D’Antoni, who signaled his approval for Lin’s next act of canonization. Dribbling with his right and left hands far above the key, Lin waved his teammates to the side of the court. With the last seconds counting down — 5-4-3-2 — Lin stepped toward his defender, Toronto point guard Jose Calderon, who kept backing up and then froze. In the clear air that opened between the young Knick and his defender, Lin elevated. The ball left his hand, painting a long, high rainbow arc. “Lin puts it up,” Knick announcer Mike Breen says, his voice rising. “Bang! Jeremy Lin from downtown! And the Knicks take the lead.” Nothing but net. Three. Half a second later, game over. The crowd, Mike and Mike In The Morning, Scott Van Pelt, New York, the sports nation. The world. Linsanity. Lin and the Knicks won two more in three games. In the 25 games he started before injuring a knee late in the season, Lin averaged over 18 points a game. Now he’s a global brand but not a Knick. We Knick fans wonder about that one. But yiping about how the Knicks allowed the most popular player since Patrick Ewing to slip off to another team has no influence with management. This is, afterall, the same crew that turned the organization over to head coach Isiah Thomas, whose era was marked by a lot of games lost on the basketball court, and one big loss in a judicial court — an $11.6 million judgment in 2007 for sexually harassing one of his Knick colleagues. A couple of months ago I relived Linsanity on YouTube. That was a splendid hour of entertainment and inspiration. I can’t wait to see him tear up the league this year, and prove doubters wrong again. And I can’t wait to see how Lin leverages his gifts to help the people of the planet. I wish him and us the best.